DVR cabinet removal 2010 2551 Success! 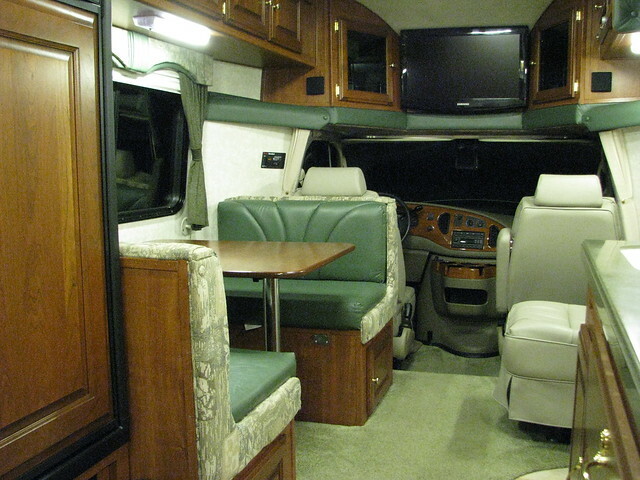 Has anyone removed the DVR cabinet in a 2551 (overhead, just forward of the coach door) and have any tips for hopefully taking it out in one piece and minimizing damage to the coach interior? The first time I banged my head on the protruding corner I swore I would never do that again! That was several head bangs ago (slow learner) and even my much shorter and far more intelligent wife has done it a few times. I can't afford anymore TBI's. IMHO it is a worthless cabinet in the wrong place, and is one of the few things we don't like about our 2551. I will put a much smaller dvr player and receiver in the more forward cabinet or the dash. I'm also thinking of then moving the front TV to the now empty space, mounted on an extending TV mount attached to the side of the remaining adjoining cabinet, so it can actually be seen comfortably from the couch, and build some storage where the TV was. Has anyone done this? Any tips, tricks, or cautions? I can see and feel a few screw heads inside the cabinet, it's the ones I can't find I worry about. I was a carpenter back in my adult life (now post-adult I guess) and am pretty handy. I also have a 2010 2551. We only had it for couple months with one trip. I too wondered about that cabinet. If you can manage to remove the cabinet and install a tv that would be great! You might read Barry-Sue entry on installing tv and arm. He had to install a ledge to secure the tv during travel. Keep us informed on progress. I used this bracket as a fixed mount to hang a 21" tv under the cabinet behind the passenger seat in my 2350. My tv is almost flush against the transition panel. Don't know if this would work in a 2551 since there is less space between the cab and side door. The viewing angle from the sofa is ideal. Thanks for the info, wish me luck. I fear there will be one screw left that I can't find and I'll be left holding the cabinet up for eternity. Good luck! Keep us informed. Take some pictures. You might consider calling PC service and ask if you send a picture of the cabinet could someone from the floor identify potential areas where screws exist. I started digging into the whole concept and all that is involved, thinking to make it work right and move the TV would involve re-positioning the surround speakers, the light and the awning switch, all easy a decade ago but more than I wanted to get into now, To just remove the cabinet would not be that hard, but would leave some marks on the ceiling, which could be dealt with. The marks left on the wall and padded cabinet, which the TV would have hidden, were another story. Having to get a new and smaller DVD player was the kicker. The head-banger cabinet is going to stay for now, as this old dog tries to learn new tricks and avoid the offensive corner. I had to remove the TV anyway to add an HDMI cable for a Dish Wally. Our TV had just four screws, very easy to do. In doing so I found the muffled center speaker hidden behind the vinyl covered padding under the TV. That padded strip under the TV came out with two screws and will be discarded, leaving the speaker and some plywood exposed. I will cover that whole area below the TV with some thin open-cell foam covered with black speaker cloth so the speaker can actually be heard. Not sure what they were thinking at PC at the time, but this should at least fix that problem. In doing so I found the muffled center speaker hidden behind the vinyl covered padding under the TV. That padded strip under the TV came out with two screws and will be discarded, leaving the speaker and some plywood exposed. I will cover that whole area below the TV with some thin open-cell foam covered with black speaker cloth so the speaker can actually be heard. Not sure what they were thinking at PC at the time, but this should at least fix that problem. If your PC TV is like the one I installed in our PC in 2007, the speakers in the bottom of our TV (facing downward) are not active when using the surround sound system. You might want to check your TV over well before tossing the head-bumping protective pad to avoid a second area to contend with. Ron, thanks for the "heads-up!" 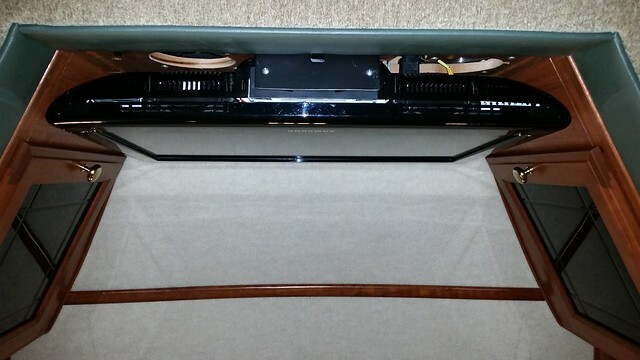 Our 2010 2551 has a separate speaker built in under the TV connected to the surround system. Our TV speakers are disabled and use the Samsung surround for output. The padded speaker cover I install over the approx 4"x 30" now exposed area will hopefully provide some protection...I usually hit my head on the rear camera monitor mounted right there already anyway! I spoke with Dave at PC, he said he knows of others who have either removed or relocated the front TV. There is nothing structural behind the TV, just a flimsy piece of paneling you could cut out with a utility knife and put some shelf and storage there. The shelf and bottom in the DVD cabinet are two-piece and have only a screw or two holding them down, come out easily. ......I usually hit my head on the rear camera monitor mounted right there already anyway! Boy I surely can relate to hitting of the head on the back-up camera. It drove me nuts, so much that I had to do something about it. 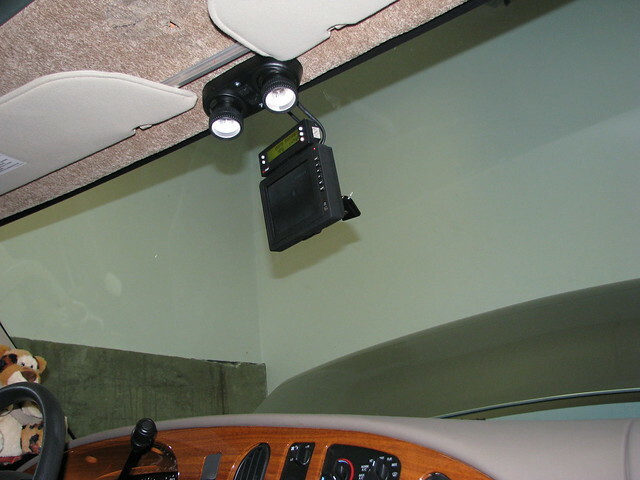 I removed the rear view mirror, and mounted the back-up camera there as shown. I have not yet done anything about the scars left in the headliner. I thought of visiting a junk yard and find a low profile sunglasses holder to mount there. About the TV mount area. There is 1/8" finish board on the surface. You are right in that it can be cut with a utility knife. BUT, right behind it is a sturdy structural 3/4" particle board with a nice printed wood grain finish. You can sort-of see mine here. I added a pair of cooling fans behind our hot-running non-LED TV. I would like to replace the TV with a low wattage 32" LED version, but ours is working so well minus the energy consumption. One thing I really like about our 26" Samsung TV are the front-controls eliminating the dependency on the remote controller. Yours is different than my 2010. There is no solid panel behind our TV. Did yours not come with the TV from PC? Our center speaker and the TV speakers are (were) blocked by the center padded trim. I think it will look good when I get that area covered with a speaker grill. I am also going to replace the glass in the front cabinet doors with a black grill to allow ventilation to those cabinets. That glass looks like something my granny would have had...when I'm done it will look like there are huge speakers there....hmmm....maybe two 12" 3-ways mounted to the doors? No one parking right next to me anymore! Oh, we ordered our PC without any TVs. At that time in 2007, Phoenix wanted a lot of money for a 4:3 aspect radio 21" TV up front. I bought a larger wide screen 26" at the time for 1/3 the price. Today a 32" wide screen in that space is much cheaper yet. Look at this 2552 PC and the place the TV is mounted. WOW this might work on our 2551s although the 2552 has more room. I have to take some measurements. I requested some pics and more info from the seller. Here is a potential mount from Barry-Sue that might work nicely. The TV and arm could be removed and placed on the bed while traveling, if desired. The owner of the 2552 for sale had it mounted with an under cabinet tv mount. The shelf might be in the way in the 2551. I will look into it when the weather breaks. Here is an under cabinet tv mount. CalCruiser also mentioned one below as well. Well, it took 6 weeks of should I, shouldn't I, with a lot of what if's and how do I's, then I hit my head on the corner of that damn cabinet again, got out the weapons of destruction, and started into it. The process is not for the faint of heart. You gotta love a challenge and not fear to blur the fine line between bravery and stupidity. There was no need to worry about the offending cabinet falling on me. It had to be deconstructed piece by piece to access the wiring snaking through it and the four screws holding the remaining framework to the ceiling and wall. I was careful with the pieces in case I hit a road block and had to reconstruct it. 38 different pieces of wood in one cabinet...no wonder these are pricey. Glad there was no glue, only hundreds of staples, which only need some coaxing and a yank. Then the point of no return was reached. No way was I putting all of this cheap wood back. And I could visualize the TV in the place it should have been all along, and see a plan to make it happen.